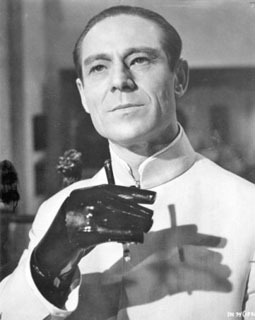 Canadian/American actor Joseph Wiseman is best known for his appearance in the title role of Dr. No (1962), the first James Bond film. As member of SPECTRE, his plan is to use a high-power beam weapon to disrupt the American space program. Unusual for any Bond film, he appears only towards the end. Wiseman preferred to think of himself as a stage actor, and was somewhat dismayed by its success. He had no idea that the film would become part of the institution it is -- at the time, he considered it "just another Grade-B Charlie Chan mystery." Wiseman appeared extensively on Broadway, beginning in 1938 with a small role in Abe Lincoln in Illinois. Among his appearances is the title character of In the Matter of J. Robert Oppenheimer, which won the 1969 Drama Desk Award for outstanding performance. Wiseman died aged 91 at his home in Manhattan.